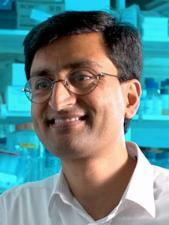 Professor Ashok Venkitaraman is a Professor of Cancer Research and Director of the Medical Research Council Cancer Unit and a Fellow of Pembroke College. He also coordinates the Cambridge Molecular Therapeutics Programme, a multidisciplinary initiative in the University, which aims to pioneer innovative new approaches for the discovery and clinical development of next-generation medicines. Ashok’s research in centered on the understanding of the network of cellular mechanisms that preserve the integrity of human genome and which, upon failure, lead to cancer. Focusing on pancreatic ductal adenocarcinoma, he develops novel transgenic models and other new experimental tools with wide applications in several fields and to a broad range of research interests relevant to genome stability and cancer. The resulting development of new approaches to the therapy of the commonest human cancers such as small-molecular therapeutics can impact the lives of the world’s poorest 3 billion people.